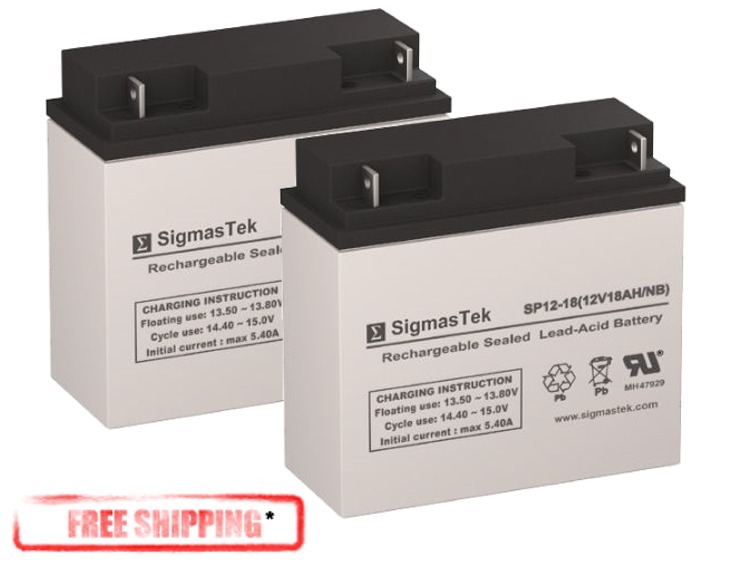 SLA Sealed Lead Acid Batteries Replacement twin pack 12 V x 18 AH Sealed Lead Acid Batteries from Sigmas Tek. The compatible replacement for 12V-18AH Sealed Lead Acid rechargeable battery meets or exceeds the OEM SLA battery specifications. We supply only brand new, factory fresh, high quality batteries. Consumer Electronics, Electric Vehicles, Engine Starters, Scooters, Hunting, Lawn and Garden Tools, Medical Mobility, Motorcycles, Photography, Power sports, Portable Tools, Solar, Toys and Hobby, Access Control Devices, Emergency Lighting, Security. *Please note the brand of battery changes and is dependant on our suppliers stock at the time. Most mobility scooters require two or more batteries. Replacing a single battery in a mobility scooter is not recommended and will invalidate any warranty. please contact us if you require further assistance. Image shown may vary from the actual product. All Batteries come with a 6 month limited warranty.